The title of this post was inspired by a student blooper in a sociology paper where the writer surely did not mean to say "blue color workers". Spell checkers have their limits. In the right context, however, blue color workers is not a candidate for Richard Lederer's next collection. 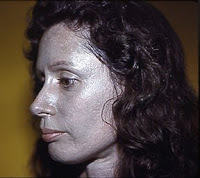 Exposure to silver can cause argyria, in which the skin turns a grey-blue color as a result of deposits in the dermis of metallic silver and silver compounds. Unlike the orange coloration that eating too many carrots can cause, the dark grey cast of argyria is permanent. The condition can be striking if the entire body is affected. Barnum & Bailey's Blue Man was found at autopsy to have argyria, perhaps from exposure while working as a silver miner: a real blue color worker. Argyria in this century is more likely a result of exposure to quantities of silver in non-industrial settings. Silver preparations were used pharmaceutically in the early 20th century, and much of the literature about silver and skin discoloration dates to that time. There are reports of cases of argyria arising from use of colloidal silver compounds. Externally applied, salts of silver are effective antiseptics, hence the marketing of these silver solutions as nutritional supplements "to support the immune systems" and as "all-natural antibiotics". There is no evidence that these compounds are effective in these ways when taken internally - and the risk of being permanently blue is not one to be taken lightly! The FDA has ruled that products containing silver or colloidal silver are "not safe and effective" and may not be sold as having any medicinal benefits. Despite this, colloidal silver is readily available. 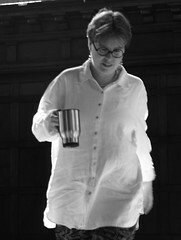 The photo is of Rosemary Jacobs, who suffers from argyria, and is used with her permission. In 2006, Stan Jones, ran as the Libertarian candidate for U.S. Senate in Montana. He took a colloidal silver compound in 1999 and now has argyria as a result. Reminds me of those robotic street performers or "living statue" guys...kinda cool, in a disturbing way. Never heard of this; very interesting I have encountered silver-based products for sterilisation of drinking water. It was in India about 20 years ago and the Germans using the stuff assured me, with characteristic Teutonic certainty, that it was far superior to the tincture of iodine that I was using. No idea what it was although their skin coloration appeared normal at the time. I guess one could probably gdet thru a lot of silver on a rount the world trip. "Chemistry is not a world unto itself. It is woven firmly into the fabric of the rest of the world, and various fields, from literature to archeology, thread their way through the chemist's text." You should talk about what's going on in the rest of the world. Like why aren't you talking about the horrible career prospects for chemists? Or outsourcing, etc? 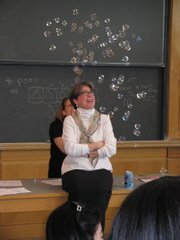 Or the absence of any new chem faculty positions? You come across somewhat shady.I assume you only care about keeping your own bowl filled. The blog is not all things to all people. It's not about the chemical industry, academe, or chemical employment -- others cover these issues well(see In the Pipeline for example) -- it is about science literacy. Interesting write-up, sis. Perhaps it was not a typo at all just a new reference to the Blue Man Group! Love From Texas! It is indeed an ongoing concern for many, though I think the dose of silver particles an/or salts must be very high (way beyond recommended use) in order to cause the argyria condition. silver medicine challenges corporate pharma. So, what can we expect from the cultured professor but propaganda for pharma ? Fortunately, the web enables the undead literate to discover the truth about argyria and colloidal silver use. So that blogs like these primarly serve to stand as a testament to the arrogance of the elite. Argyria is caused by taking colloidal silver with large particles. If one takes silver with particles that are too smll to get "stuck" in capillaries, there will be no argyria. Using a very low voltage silver generator (i.e., 3 volts, not 15 or 18 or higher) results in a small-enough particle size. I have cleared up a long-standing, undetected-by-standard-medical-tests systemic infection (microbes were easily seen in my blood under a dark field microscope) by taking small-particle-size colloidal silver. I am not blue. You are a chemist...you should be able to do this research. The person I know who did the research is an electrical engineer, as am I.
Wow, never heard of it before. I was just researching if silver dragees are safe to eat. I think I'll avoid them, as I don't wish to have any extra silver in my body if it might turn me grey. Never heard of it until now. I guess I won't eat those silver balls on my cookies. 60 Year old picture of people that were allergic to silver. I saw these when I was 14 years old LOL! Silver has been documented in medicinal books as early as 1914 to have been used to treat bacterial infections. VERY….VERY Few people have ever contracted argyria in the last 100 years or so, compared to the MULTIL Millions if not billions of users since 1914.